"Silently behind a door, it waits." Backdraft is an action-adventure film that was released in 1991. 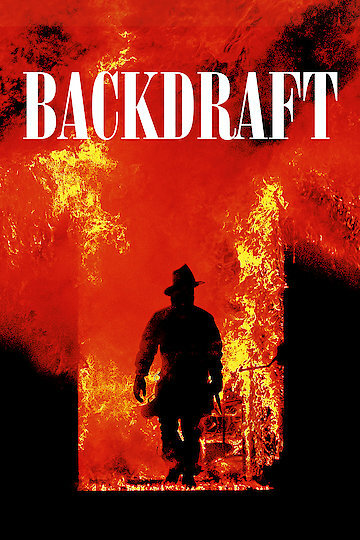 Backdraft follows a group of fire-fighters from Chicago and the dramas and difficulties they face in their personal lives while they fight fires as their job. The film centers on two brothers, Stephen and Brian. The brothers both became firefighters because their late father was one and they are both competitive with each other. Stephen does not believe that Brian has the ability to be a firefighter. Stephen is facing a lot of drama in his personal life. His wife has decided to separate from him because she is so worried that something will happen while he is fighting fires. The firefighters are facing a lot of challenges from the city government as well. A city alderman is planning to run for mayor and his platform calls for cutting the budget to firefighters. This is complicated by the fact that Brian’s girlfriend works for the alderman so he gets a lot of drama from the guys. The city is being plagued by a serial arsonist who ends up striking a high-rise building. When the firemen go to the building, one of them is badly burned when he opens a door. The firefighters blame Stephen because Stephen employs a lot of questionable methods when it comes to fighting fires. At a scene of a different fire, Stephen finds out that the arsonist is another fireman. He confronts the man who is killed by falling out of a riser into the flames. Stephen is also terribly injured. He is transported to the hospital where he tells Brian about the other fireman but he begs him not to tell anyone else. Stephen then dies. Brian is devastated but he makes the promise to himself to continue fighting fires. The film ends with the city alderman losing his mayoral bid and the funding staying intact for the fire department. Backdraft is currently available to watch and stream, download, buy on demand at Starz, Amazon, Vudu, Google Play, FandangoNow, iTunes, YouTube VOD online.